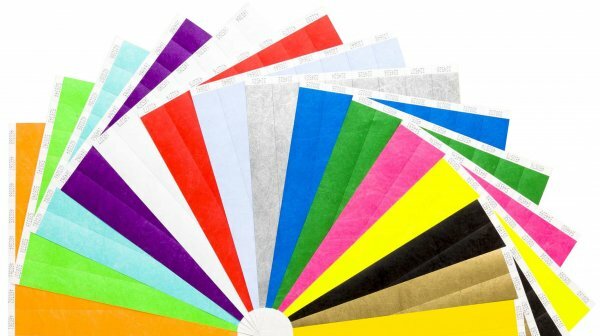 Our unprinted 19mm and 25mm Tyvek Wristbands are the sensibly priced answer to your entry and group control challenges. These strong, waterproof wristbands not only help reduce entrance losses, but offer a security system for all groups where organisation and safety is of paramount importance. Tyvek is a synthetic, waterproof material  extremely durable, tear resistant and tamper apparent. To minimise transference, not only is the closure designed to shred and the band unravel, the Tyvek wristband also concertinas if stretching is attempted.The bands are easily secured with a self-adhesive tab and strategically placed security cuts prevent the band from being removed without breaking or showing clear signs of tampering. Plain 19mm Tyvek Wristbands @ £32.99 (500) – £0.065 per wristband! Plain 25mm Tyvek Wristbands @ 39.99 (500) – £0.079 per wristband!